UN Security Council to meet after 150 killed in chemical attack in Douma, east of Damascus. 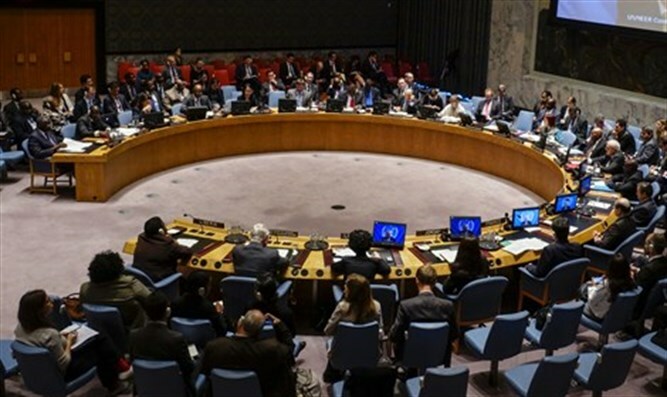 The United Nations Security Council will meet twice on Monday to discuss the deadly chemical attack in Syria, Reuters reported. The Council will meet twice following rival requests by Russia and the United States, the report said. Russia called for a meeting of the 15-member council on "international threats to peace and security." A minute later the United States, France, Britain, Sweden, Poland, the Netherlands, Kuwait, Peru and Ivory Coast called for a meeting to discuss the chemical weapons attack in Syria. "The Security Council has to come together and demand immediate access for first responders, support an independent investigation into what happened, and hold accountable those responsible for this atrocious act," U.S. Ambassador to the United Nations Nikki Haley said in a statement on Sunday. The attack, which occurred in the city of Douma, east of the capital Damascus, involved Syrian government warplanes, and according to anti-Assad monitoring groups, included the use of sarin nerve gas. Haley warned last month that if the UN Security Council fails to act on Syria, Washington "remains prepared to act if we must," just as it did last year when it bombed a Syrian government air base over a deadly chemical weapons attack. The council president for April, Peru, initially scheduled a meeting on the chemical attack for Monday morning and a meeting on the Russian request for Monday afternoon, noted Reuters. However, diplomats said Russia was insisting its meeting be held first because its request was made first.